Peer Reviewed by Janet Klein, Ph.D. and Hilal Sursal, Ph.D.
Coming Soon! Expand your knowledge of the Turkish language and culture through engaging, in-depth dialogues and unscripted discussions between native speakers. Watch video and read about art, food, contemporary media, legal issues, travel, soccer, horoscopes, folk tales, music, and more. 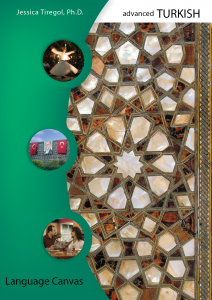 Advanced Turkish was developed and peer-reviewed by Turkish language experts, and was classroom tested by college students using it as their textbook. Advanced Turkish is equivalent to a one year college course, and was originally published as part of the well-reviewed University of Arizona Critical Languages Series. We are looking for a limited number of Beta Testers for the full course with Multiple Choice, Fill-in-the-blank, and Listening Dictation exercises, please fill out this form if you are interested. Jessica Tiregol received a Ph.D. in Near Eastern Studies with a concentration in the areas of Turkish and Late-Ottoman studies from Princeton University. Her research examined the role of primary education in nation-state-building for the case of the early Turkish Republic. Her professional experience has been in the field of instructional technology, specifically web development, content and project management. She has developed web sites and has assisted in computer-aided instruction for countless courses and organizations in all fields especially foreign languages. She is currently working for the UCLA Library as the Head of Digital Initiatives & Information Technology Operations Services. She has also begun a project for a web-based language instruction program allowing for the creation and sharing of language materials among language instructors and learners. She is also the author of our Intermediate Turkish course. Advanced Turkish materials © 1995-2019 Arizona Board Of Regents on behalf of the University Of Arizona. Used under license.